In its first major hardware upgrade in three years, TiVo introduced its fifth-generation hardware DVR series on Tuesday. On sale now with the odd nickname of "Roamio," the new boxes promise a faster user interface and built-in streaming to iOS devices. At first glance, this new generation of TiVo looks like a big step up for cable TV subscribers who want to ditch their generic cable DVR. 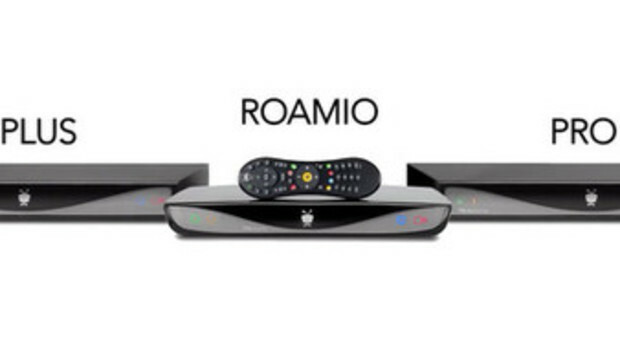 The Roamio, or TiVo Series 5, line consists of three models. A smaller $200 Roamio model offers four tuners, off-the-air antenna support, and 500GB of storage. The larger models are largely the same except for storage--the $400 Roamio Plus model offers 1TB and the $600 Roamio Pro offers 3TB. Both high-end models support six tuners via multistream CableCard (there's no ATSC tuner) and include integrated "TiVo Stream" functionality, previously available only as a $130 standalone product. As always, you also need TiVo service, available for $15 per month or $500 for the lifetime of a device. TiVo Stream allows users of TiVo's iOS apps to download shows to iOS devices for later playback as well as stream live TV within a home network. TiVo officials said that later this year its iOS app would be updated to support streaming and downloading video from its DVRs from anywhere on the Internet. A prerelease app with this functionality worked impressively well--live video from a remote video source was of good quality during a recent demo I attended. TiVo said that the interface on the new boxes would be between 1.5 and 2.5 times faster than on their previous generation hardware. Most of that speed boost appears to be in the launching of third-party apps, most notably Netflix. On the old hardware, launching the Netflix app required a lengthy delay that made the boxes almost unusable as Netflix streamers. The new hardware launches to Netflix in a few seconds, and the onboard Netflix app is the most modern version of Netflix. TiVo's integration of Netflix, Amazon Instant Video, and other video sources into its program guide is one of its most clever features, but delays to watch content from those sources took much of the shine off. Other menus appear to be faster than in previous-generation TiVo hardware, though there are definitely still places where you have to press a button and wait a few seconds for something to happen. TiVo also says that it's upgraded more of its interface into HD, though there do appear to still be a few menus that are rendered only in standard definition. And the new TiVo remote uses radio rather than infrared, so you can hide the box in a closet if you want. The new TiVo DVRs also support TiVo's existing $100 TiVo Mini product, a tiny streamer box that connects to another TV set and your home network and can stream recordings or live TV from the main TiVo DVR. With the new software in the Roamio models, tuners are dynamically assigned only when a TiVo Mini is currently watching live TV, rather than the old approach of permanently locking up one tuner for each installed TiVo Mini. That means a house can have several installed TiVo Minis without locking out the main DVR's recording flexibility by blocking off some of its tuners. We've got a TiVo Roamio Plus on the way and will be providing an in-depth review soon.